Kilimanjaro my 2016 climb. Thanks to Ian and team for helping me, and giving me the tools to believe I could climb Kilimanjaro. My journey was challenging as I needed to lose 30lbs and get back in shape. It took me 12 months to prepare, get fit and ready to take on this Kilimanjaro challenge. A friend of mine climbed Kilimanjaro with Ian in 2011 and she had a life changing experience. It took me a while but I wanted something similar for myself and needed a goal to get me moving towards. My journey to Kilimanjaro exceeded my expectations. Ian was with me every step of the way and we talked every month about training, gear and getting physically and mentally ready to climb Kilimanjaro. His experience, guidance and support was amazing, greatly appreciated and paid off. I started training 3 days a week, walking flat on the treadmill and outdoors for 30 minutes building up over 3 months to walking 5 days a week for one hour+ per day. I also had to adjust my diet. Between 3 and 6 months I was walking up hill on a stair master and treadmill with 8lbs. It was slow going, but fixing my diet was critical to loosing the weight and carrying the weight really started to give me strength and conditioning and started to feel much better. As my training progressed I lost 40lbs and was able to jog for the first time in years. I started to feel a lot stronger and comfortable increasing the weight and time I was spending training. When it came to the mountain’s Ian’s set up was second to none. We had quality tents, equipment, food, toilets and the best staff on the mountain. I was nervous going to Kilimanjaro but the team where phenomenal, we had all the safety equipment, almost 1 to 1 guide to person on the team for the summit night, which was amazing!! The pacing of each day was perfect and getting to the top was the most memorable experience of my life! This was hard work but worth all the effort. Coming down was hard but the low I got the better I felt and was happy to be back in Mweka camp. It took our team 13 hours hiking in the summit night and day. 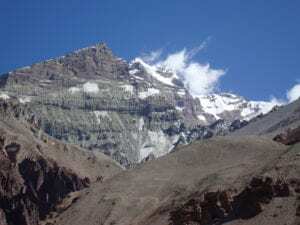 I will be climbing Mera peak next. I am training 5 days a week, eating better and enjoying life. Ian and team played a major part in my transformation and happy to call them friends and family. Patrice Weinstein, Kilimanjaro my 2016 climb.